VizualWorx – See through the clutter. Uncover the possibilities. See through the clutter. Uncover the possibilities. We partner with you to visually solve problems, communicate ideas, facilitate change, and bring your ideas to life. 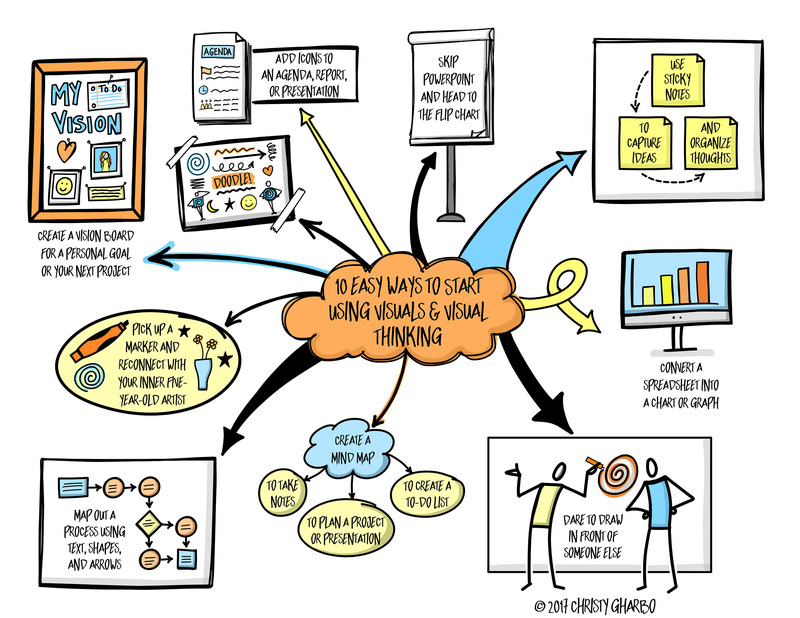 We provide visual mapping and visual facilitation, and we use visuals and visual thinking to integrate visual processes and tools into your workflows and business processes. Our visual mapping service captures your ideas and translates them to paper, creating a visual representation of your thoughts. Your ideas take shape in a way that creates structure and provides clarity, allowing you to make meaning, generate more ideas, uncover patterns, make connections, solve problems, and create actionable plans. Our visual facilitation service moves groups toward a goal using visual templates, visual mapping, visual note taking, and visual organization of key ideas and concepts. The use of visuals encourages participation, increases engagement and understanding, provides focus, promotes deeper thinking, and creates real-time documentation. Our visual processes and tools service integrates visuals and visual thinking into your business to improve your business processes and share your key messages and ideas. Your work and your content become more visible, increasing understanding, efficiency, collaboration, engagement, and communication. Click a service above or contact us to learn more about how we can partner with you and/or your organization. Download "10 Easy Ways to Start Using Visuals and Visual Thinking"
Copyright © 2018 VizualWorx. All Rights Reserved.